You can run a NinjaScript strategy in real-time in a live or simulation account via the Strategies tab of the Control Center. •A NinjaScript strategy is a self contained automated trading system and orders generated are live and not virtual. Cancelling strategy generated orders manually can cause your strategy to stop executing as you designed it. If you want to manually cancel an order, terminate the strategy first. 2.Right mouse click within the Strategies tab. The right click menu will appear. 3.Select the menu item New Strategy... The New Strategy window will appear. 6.Check the box in the Enable column of the Strategies tab next to the strategy you wish to enable. Note: You must set the "Enabled" property in Step 6 above to True to turn on the strategy. When this property is disabled, the strategy will be applied, but will be inactive. Sets the type of market data used to drive the Data Series. Sets the bar type of the Data Series. Sets the Data Series value. •On each tick - calculate the indicator's value which each incoming tick. Sets the maximum number of historical bars to use for strategy calculations. The TwoHundredFiftySix setting is the most memory friendly. 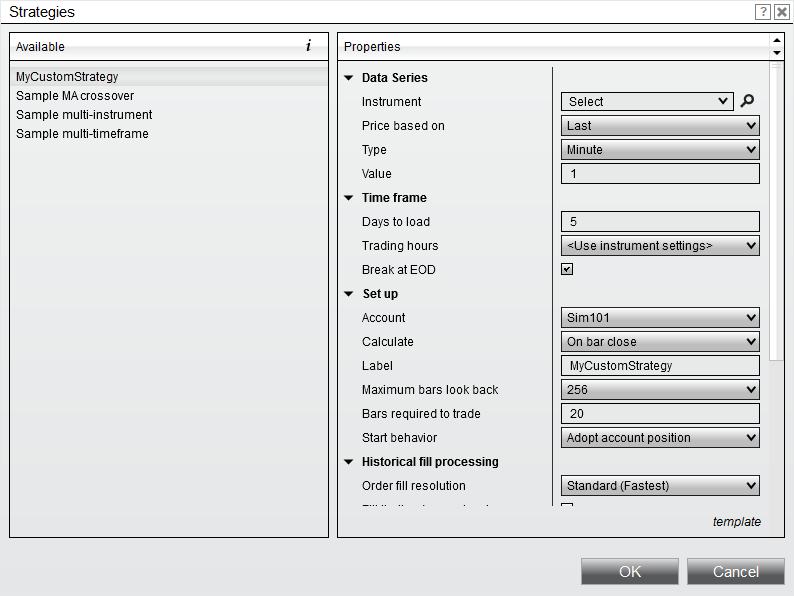 Enables or disables the filling of limit orders on a single touch of price action. Sets the manner in how entry orders are handled. If set to "AllEntries", the strategy will process all entry orders until the maximum allowable entries set by the "Entries per direction" property has been reached while in an open position. If set to "UniqueEntries", strategy will process entry orders until the maximum allowable entries set by the "Entries per direction" property per each uniquely named entry.